I’m one of those people who wander around a lot. I can’t seem to help myself. Put me in a garden, rain or shine, and I’ll find something to look at or to do. Recently I was offered the chance to try a Roo, a nifty garden apron that comes with its own built-in, handy pouch (think, kangaroo). I love this apron. Aprons are making a comeback, you know; they’re not just for Donna Reed and all those 50s’ TV moms. The pouch is the best part of the Roo. If you’re out weeding, you don’t have to leave a pile to rake away later. Just drop the weeds in, and head over to the compost pile. 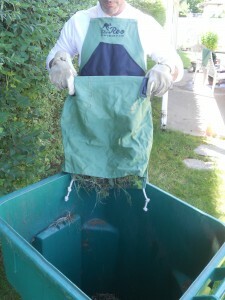 Open the pouch, and it acts like a funnel, dropping the weeds where you want them. Roos come in purple (my fav), green, blue, and red. They’re “one-size-fits-all” and washable. Joe Gardener, of TV’s Growing a Greener World, picked the Roo as one of a gardener’s “must-have” products. I’m giving it a big, green thumb’s up, too. Fair notice: Thanks to Tamara Cullen for sending me a sample Roo apron. Images are courtesy of Roo Gardening Apron. I’m getting on an apron kick. Have you seen the pretty Ice Milk aprons? But those are for the kitchen. 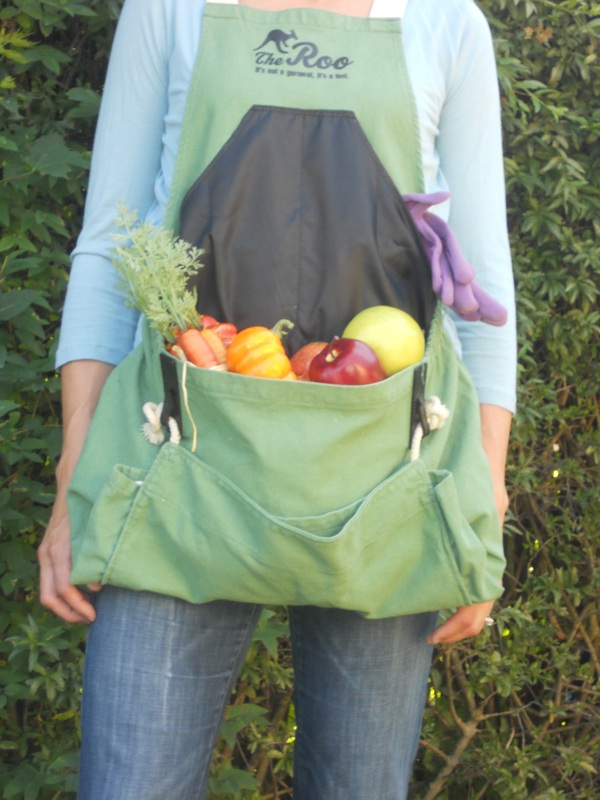 You need a really durable apron like the Roo for gardening. Thanks for writing!